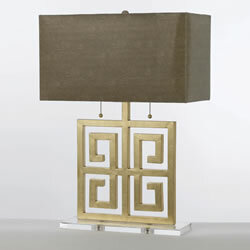 Classic greek design in gold foil on a crystal base. Topped with a faux snake shade in natural. Due to hand-crafting, no two are alike. Great addition to our 8269-TL and 8299-TL.